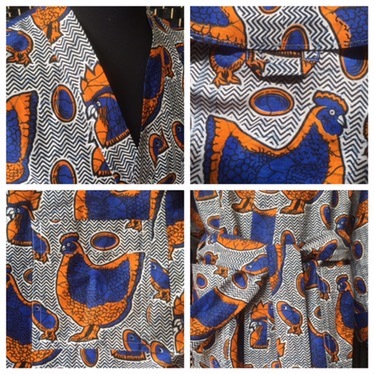 Wax Print – Full Chicken Pocket! Well, we got a fantastic deal on packs of wax print cotton. £12 a bag. I didn’t measure it but it said 10yards, I can’t quite believe that, but it’s what the ticket said! … Perhaps if you cut it in half & sewed it end to end…?! Still, there was PLENTY for the price & we were more than happy! We decided we’d have dressing gowns. AuntieE chose a very tasteful blue (“is that MY navy???”!) 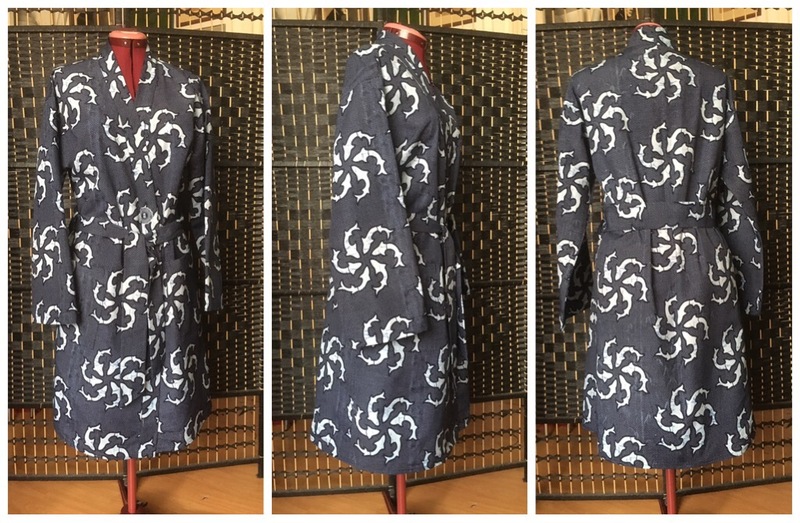 with sea creatures making a sort of star pattern on it. I went all out with the orange & blue chicken print. I ordered New Look pattern 6233 from Minerva Crafts as it didn’t look too tricky. I liked that it sort of had a kimono feel to it without having all that bunching under the armpits and those crazy sleeves to dip in all your cups of tea. If I’d have cut it out more carefully I’d probably have had enough fabric for the robe and some pj trousers out of each fabric pack. I made mine first so if I mucked it up then AuntieE ‘s could still be ok. My overlocker was playing up again so I decided to use the overcasting foot (the one with the little brush?) and a nice tight zig zag on my Janome DKS30. I didn’t try matching anything but I kept the chickens on a level. I wanted a full chicken on each pocket so didn’t try matching those. I love how crisp the wax cotton is to work with. It cut very nicely and, when pressing, I noticed I got a better result using medium heat & no steam. I guess this gave a chance for the waxes to melt a bit & re set…? It came together pretty smoothly. And in just over 3 and a half hours, so I motored straight on to AuntieE ‘s. As this was a ‘gift’ (she bought the fabric, I ‘just’ made it!) I decided to do French seams. I also made an extra belt carrier to use as a hanging loop for each of them. It was really nice making the same pattern twice in a row. 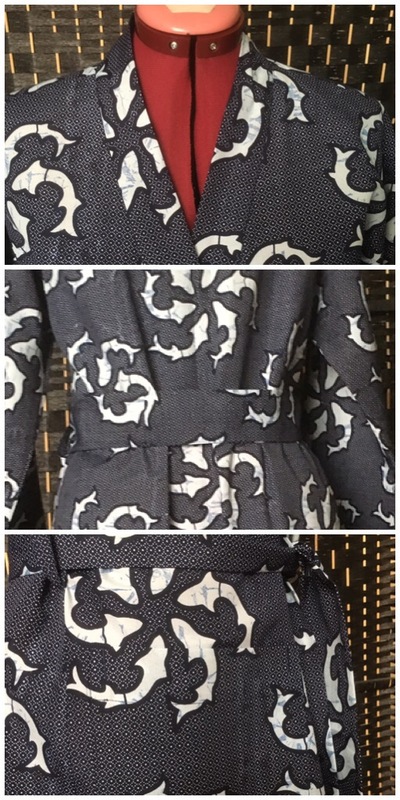 Doing the French seams and matching the pockets kept me on my toes, but I could really relax and just enjoy making it. I was in the zone; AuntieE’s took me barely three hours. So, if you’re looking for an easy robe pattern (did I mention it comes with pj trousers, t shirt & long sleeve v neck patterns as well?!) you could do a lot worse than NewLook 6233, in my opinion. 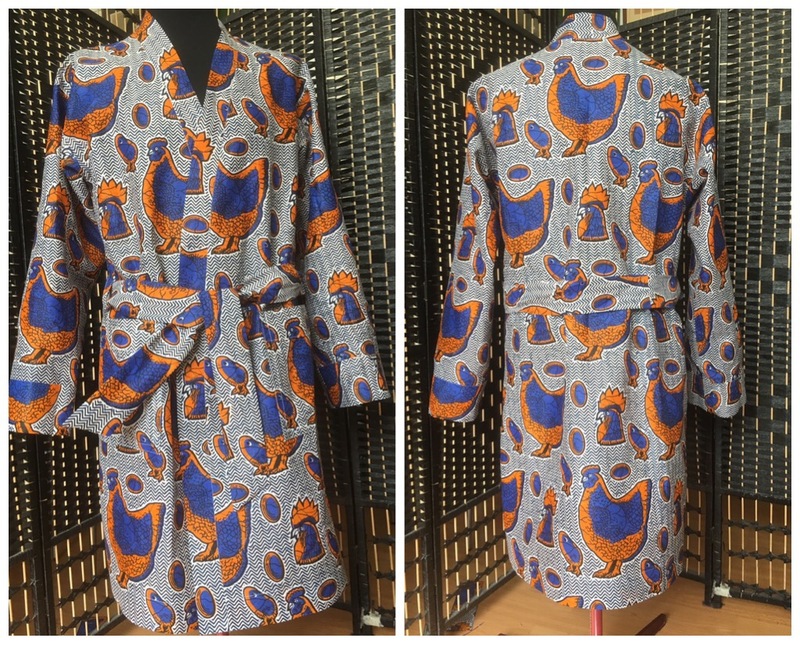 And if you want a nice summer weight robe, try a wax print cotton! It presses well, sews well and washes up soft and comfortable. When I get to make another one, I think I’ll add some piping too. Remember the power of practice! Revel in the joys of unselfish sewing! French seaming is actually quicker than zigzagging on straight seams! Previous Previous post: Final Variation…? Next Next post: New Jacket- Vintage Machine.